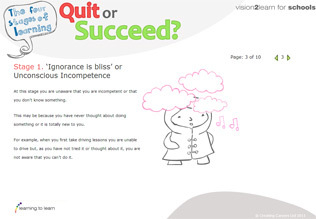 Quit or Succeed is a ‘Learning to Learn’ resource and is part of our suite of ‘performance boosters’. These are resources designed to help your learners explore their considerable capacity to learn and to help your school implement ‘Learning to Learn’ strategies in practical, hands-on ways. Have you ever wondered why some people always seem to stick to their studies and stay motivated, while others give up when the going gets tough? Our newest performance booster has identified the four key stages that people move through as they learn, so they can recognise the point when they would usually give up. This will give learners and teachers the opportunity to work together to overcome barriers to learning in a positive, proactive way. 'Quit or Succeed’ is designed to help students to explore and develop their learning in a practical, hands-on way. We want to encourage students to play an active role in their education and learning to allow them to succeed and gain better results through life. Relate the four stages of learning to their own experiences. All current learners will find a ‘Learning to Learn’ tab in the navigation bar of their My Study area – Quit or Succeed can be found here.